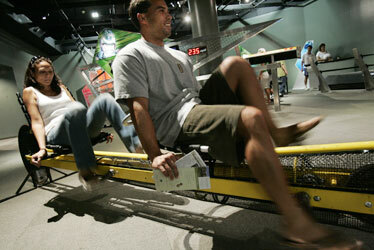 A new interactive exhibit at Bishop Museum, "Speed," explores the physics of speed. Seiko Wang smashed into mountains, hit some cattle and did several somersaults on her downhill virtual ski trek. "Normally, I'm a really good skier," said Wang, who was visiting the new "Speed" exhibit at the Bishop Museum. "The view was so narrow. I had a hard time seeing where I was going." Admission: $7.95 kamaaina and military; $6.95 children and seniors. General admission $17.95; $16.95 children and seniors. Children under 3 free. In the end, Wang admitted the obstructed view was a mere excuse. She had fun, and that was what mattered. The highly interactive exhibit opened last weekend. "People are enamored by speed," said Hi'ilani Shibata, education operations manager. "This exhibit teaches them more about the physics of speed." 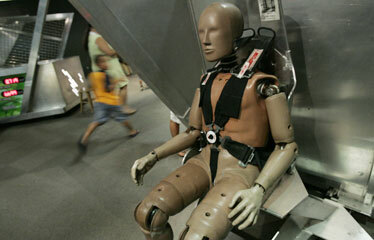 One feature of Bishop Museum's "Speed" includes a crash-test dummy that represents the average adult male at 172 pounds. Inspiration for the exhibit was drawn from sports, entertainment and cutting-edge research. Exhibits demonstrate the physical reality of speed, illustrating the math and physics of acceleration, horsepower and friction, Shibata said. She enjoys the drag-racing exhibit, where participants race cars down a long track. "Most people want to floor it," she said. "If they go too fast, the wheels won't stay on the track." Visitors can also measure their own horsepower by pedaling a stationary bike, stop motion in a turbulence tank, test finger speed and learn how various fluids affect speed. Lance Suzuki enjoyed "Speed" as much as the kids he brought with him, especially the coin-bender exhibit with its slow-motion photography. Everyone seemed to have a different favorite. "I liked building the roller coaster on the magnetic board," said 9-year-old Sydney Suzuki. "It was so much fun." For 7-year-old Zacary Chang, the Lego cars topped his list. "I want to bring my dad here," he said. "He loves cars." Noelani Hochuli and her husband, Chris, generated some horsepower on a stationary bike.